When you open up an invitation to an upcoming wedding, what is the first thing that comes to mind? Wait, don’t tell me. It’s finding the right dress, of course! We recently featured a great solution for those who love a DIY project. Liliya proves that a special handbag and shoes can also be key to a gorgeous ensemble. 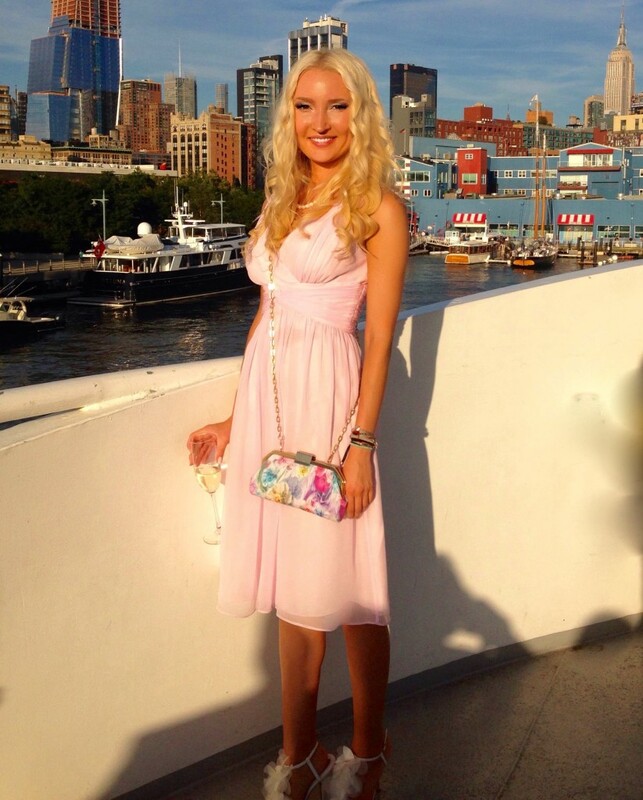 Liliya attended a friend’s wedding which took place on a boat, “one of those big ones on Chelsea Pier.” The wedding party and guests cruised around Manhattan, passing very closely to the Statue of Liberty. It was a spectacular night, and she was perfectly dressed for the occasion. 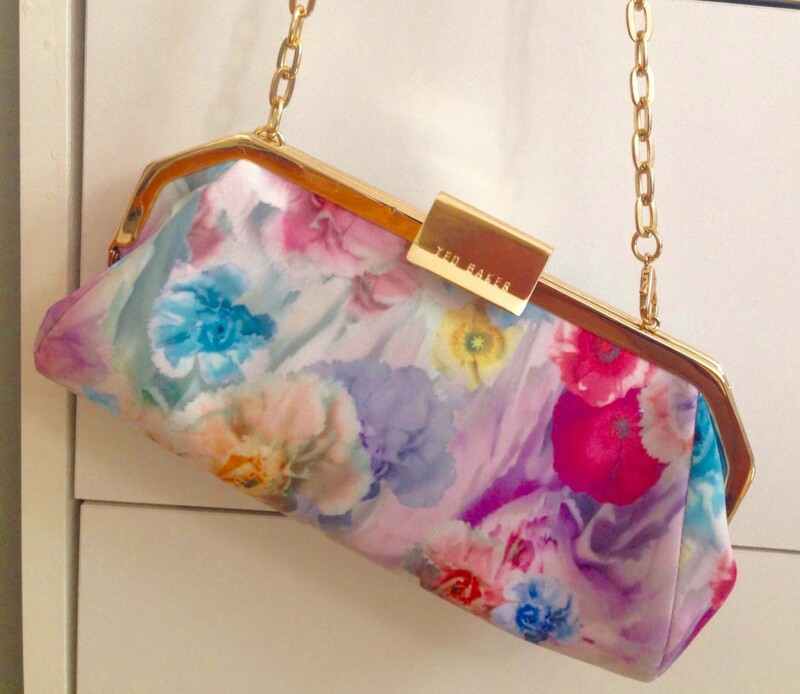 It is a floral evening clutch by Ted Baker, and oh-so-feminine. With something like this in the closet, you have the perfect accessory for your next summer wedding, elegant afternoon luncheon, or wine-tasting fundraiser. 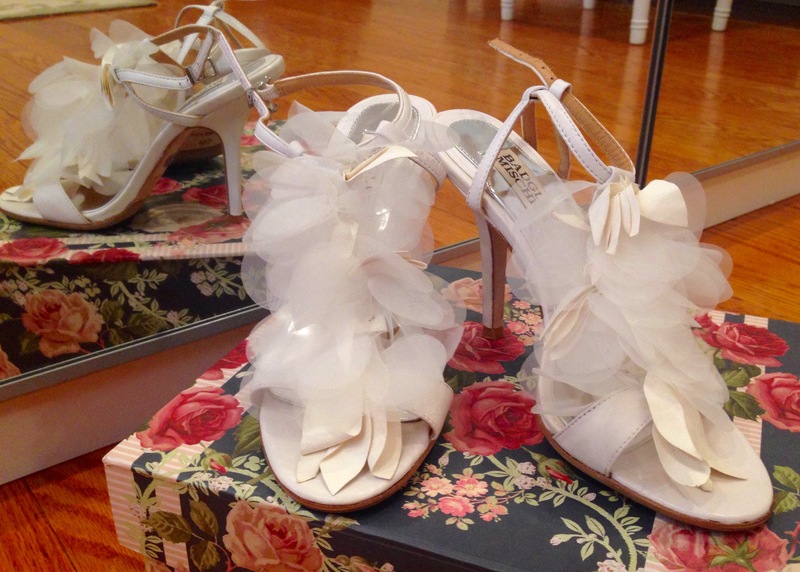 The Badgley Mischka feathery evening sandals are definitely wedding-worthy. In fact, I see them as ideal footwwear not only for a guest to a wedding but also for a casual bride – I imagine her in a silk, fitted, just above-the-knee dress – or during an after-the-fact celebration with those who cannot attend the nuptials. Or for less singular events, they are also the perfect footwear for that little white dress while dining out on a cruise ship or tropical vacation. Thanks to the elegant simplicity of the dress, Liliya gets away with donning sandals and a clutch which are more detailed and eye-catching – or we might say, eye candy. 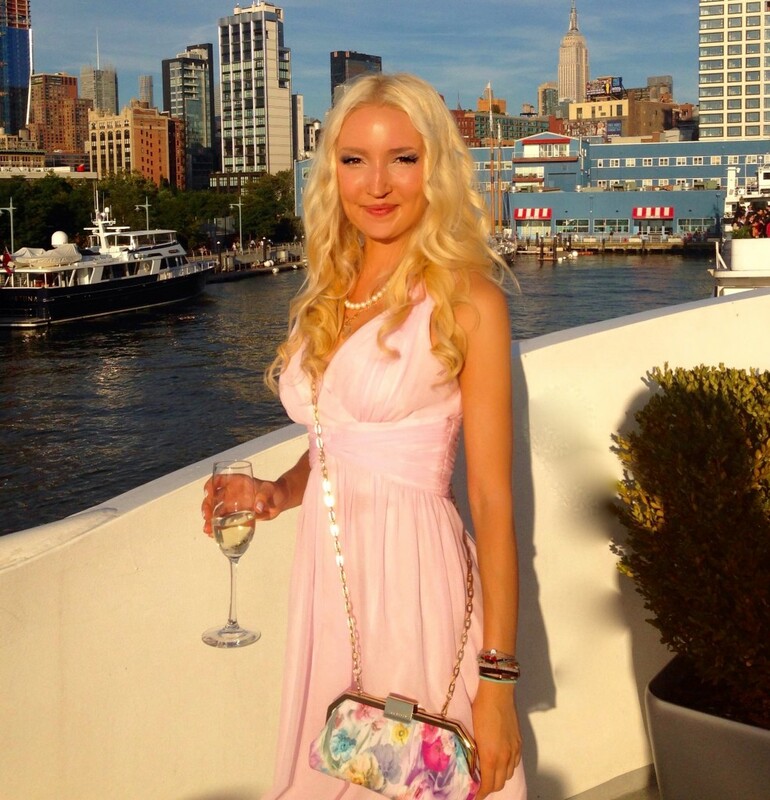 In fact, you might say she uses them to take the outfit from Marilyn Monroe to Carrie Bradshaw! Loose spiral curls and pearls add final touches to this vision of loveliness. I’m thinking that for you with a busy schedule but who loves to dress up for those extra special occasions, wouldn’t it be even more fun – and stress-free – if you had already searched out and found those extra special shoes…and bag? There’s no time like the present! 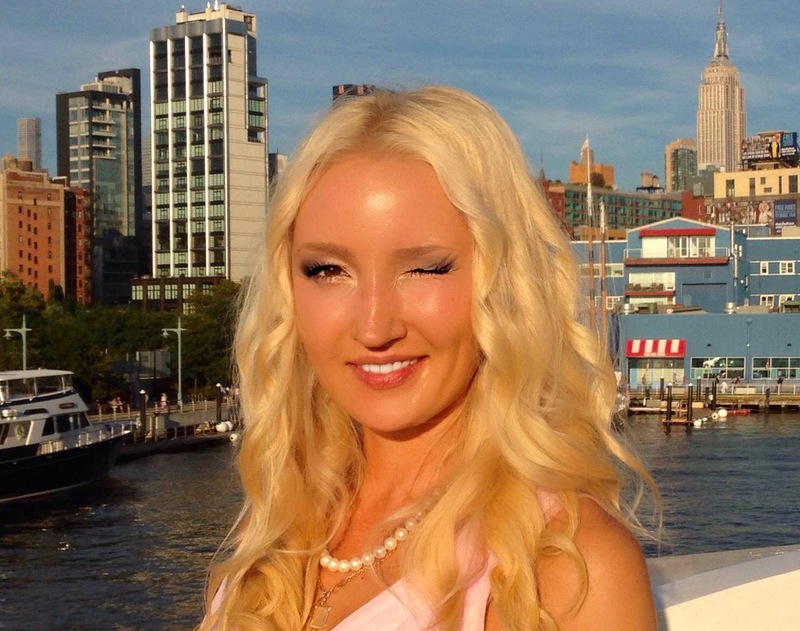 I trust Liliya has given you the inspiration!